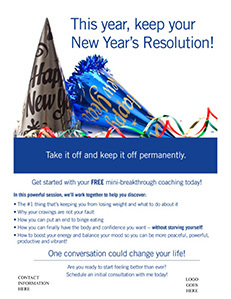 New Year’s Flyer The New Year is just around the corner, and that is the BEST time of the year to increase the marketing for your Health Coach practice! Use this FREE flyer to promote your one-on-one program and how you can help clients lose weight, have more energy and feel better all year long! Just add your logo and contact details, and start posting this beautifully-designed flyer all over your community today!Crave Marketing is behind you all the way! We want YOU to have the health coaching practice you’ve always dreamed of!